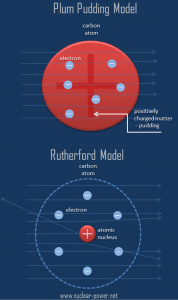 The Rutherford model of the atom is a model of the atom devised by the British physicist Ernest Rutherford. 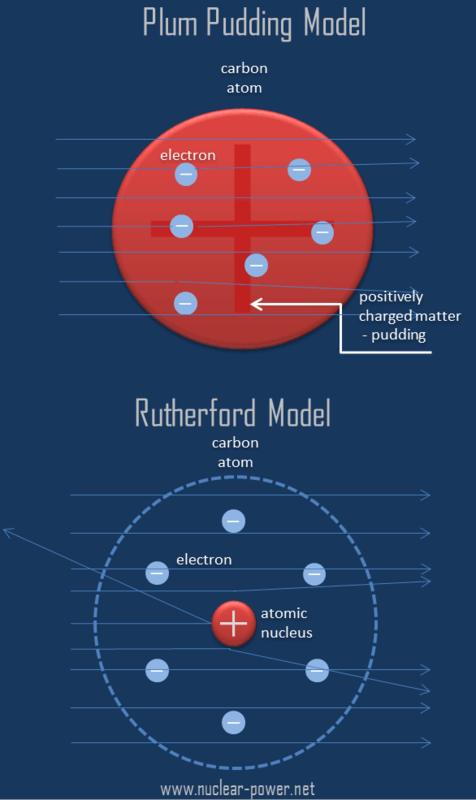 Rutherford’s new model for the atom is based on the experimental results, which were obtained from Geiger-Marsden experiments (also called the Rutherford gold foil experiment). The Geiger–Marsden experiments were performed between 1908 and 1913 by Hans Geiger (of Geiger counter fame) and Ernest Marsden (a 20-year-old student who had not yet earned his bachelor’s degree) under the direction of Ernest Rutherford. Rutherford’s idea was to direct energetic alpha particles at a thin metal foil and measure how an alpha particle beam is scattered when it strikes a thin metal foil. A narrow collimated beam of alpha particles was aimed at a gold foil of approximately 1 μm thickness (about 10,000 atoms thick). 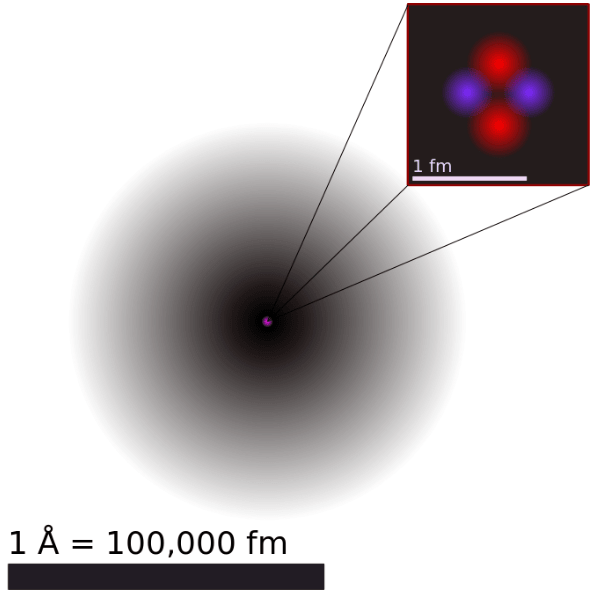 Alpha particles are energetic nuclei of helium (usually about 6 MeV). Alpha particles, which are about 7300 times more massive than electrons, have a positive charge of +2e. Because of their relatively much greater mass, alpha particles are not significantly deflected from their paths by the electrons in the metal’s atoms. As a result, Rutherford abandoned the Thomson model. Geiger-Marsden experiments were a landmark series of experiments by which scientists discovered that every atom contains a nucleus (whose diameter is of the order 10-14m.) where all of its positive charge and most of its mass are concentrated in a small region called an atomic nucleus. 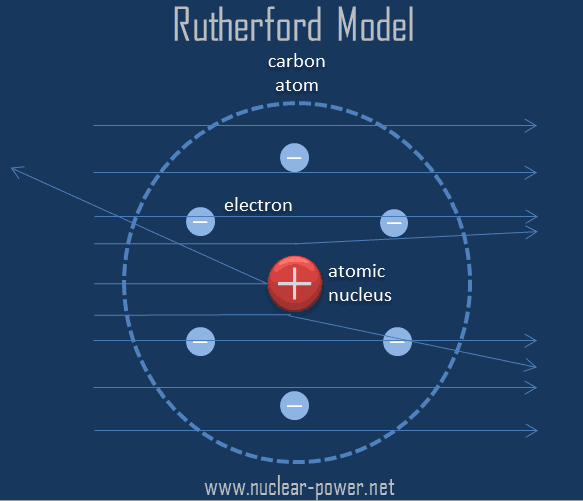 In Rutherford’s atom, the diameter of its sphere (about 10-10 m) of influence is determined by its electrons. In other words, the nucleus occupies only about 10-12 of the total volume of the atom or less (the nuclear atom is largely empty space), but it contains all the positive charge and at least 99.95% of the total mass of the atom. The volume of an atom is about 15 orders of magnitude largerthan the volume of a nucleus. For uranium atom, the Van der Waals radius is about 186 pm = 1.86 ×10−10 m. The Van der Waals radius, rw, of an atom is the radius of an imaginary hard sphere representing the distance of closest approach for another atom. Assuming spherical shape, the uranium atom have volume of about 26.9 ×10−30 m3. But this “huge” space is occupied primarily by electrons, because the nucleus occupies only about 1721×10−45 m3 of space. These electrons together weigh only a fraction (let say 0.05%) of entire atom. 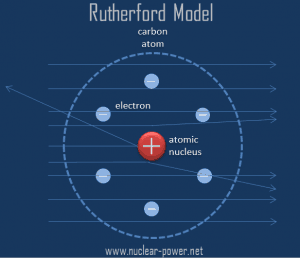 It must be noted, the Rutherford model of the atom was not the first model, which proposed a nuclear structure. 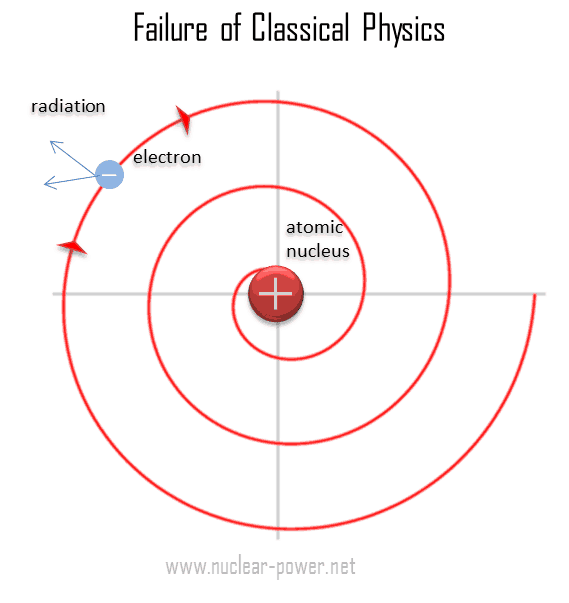 The idea of a nuclear structure was previously proposed in 1903 by a Japanese physicist Hantaro Nagaoka, who rejected Thomson’s model on the grounds that opposite charges are impenetrable.His model was known as the Saturnian model of the atom and according to this model the atom consists of a massive positive centre surrounded by a number of orbiting electrons, in the manner of Saturn and its rings. Rutherford suggested that perhaps the electrons revolve in orbits about the nucleus. In classical mechanics, a condition for the dynamic stability of such systems of rotating particles is that only forces of attraction act between its components. Classical physics also states that any accelerating electric charge (either oscillating or revolving) emits electromagnetic radiation. 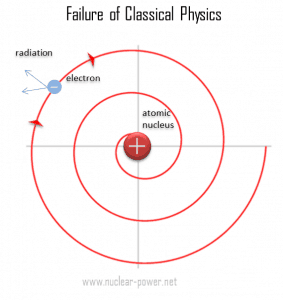 As a result, an electron orbiting inside an atom should be continually losing energy and it should spiral into the nucleus within a fraction of a second. In fact, physicists calculated that the electron should lose all of its energy and spiral down into the proton in only about 0.000000000001 second, which means that every atoms should not exist longer than a mere 10-12 seconds. The solution to the problem of the stability of the electrons in an atom was provided by young Danish physicist Niels Bohr working with Ernest Rutherford at the University of Manchester in 1913. His model adopted Planck’s quantum hypothesis and he proposed a model in which the electrons of an atom were assumed to orbit the nucleus but could only do so in a finite set of orbits. He postulated that an atom emits or absorbs energy only in discrete quanta corresponding to absorption or radiation of a photon.